There’s lots happening on the Beautiful Trouble front, but it’s been several weeks since I posted an update because of a hectic travel schedule. Time to get caught up! First and foremost – in just five months! – almost 3,000 copies of Beautiful Trouble have made their way into the hands of activists around the globe. Let me say that again: three thousand people have a toolkit for revolution at their disposal. Amazing. I have little doubt that the number will climb to 5,000 by next June, the one-year anniversary of the publish date. 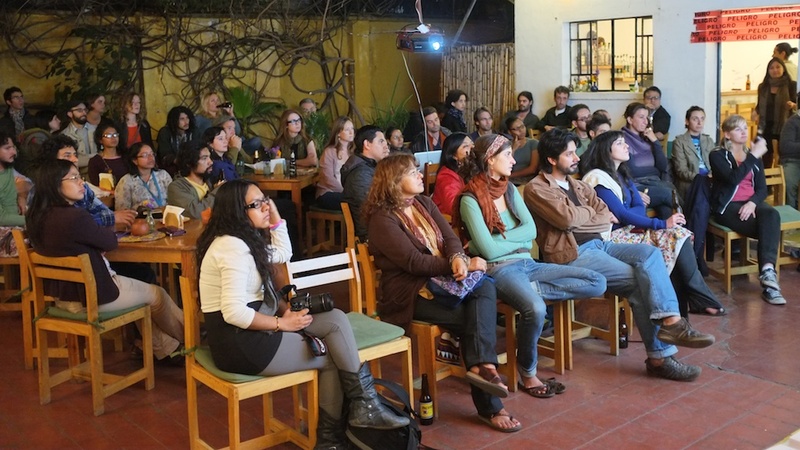 Oaxaca book launch event: Dave and Mara organized a presentation and talk at the bookshop/restaurant La Jicara here in the city of Oaxaca earlier this month. I attended the event and managed to make a video recording of the whole talk (in English, with Spanish translation). Enjoy! Matt Smucker to lead education & training: The Beautiful Trouble core team is a lean creative activism machine, which means that we’re always stretched a little thin to get working on the big picture opportunities. So we’re all pretty excited that our friend and Beautiful Trouble contributor, Matt Smucker, has decided to take the lead on Beautiful Trouble’s education & training initiatives. Keep an eye out for more Beautiful Trouble creative activism training events near you. Trouble, Visualized: A couple of months ago, I was contacted by Marian Dörk, Research Associate at Newcastle University’s Culture Lab asking if we’d thought about using data visualization to help people navigate the project’s content. In fact, we’d been thinking about it a lot – timing is everything. I met up with Marian in Seattle, where he was presenting at VisWeek 2012, and I got a chance to see some of what he’d been working on with Microsoft’s Academic Search. Having put his time in with the Evil Corporation, Marian was keen to gain some good guy karma points by working with Beautiful Trouble. So, over the next couple of weeks, I’ll be working to provide a JSON data feed of the content from the www.beautifultrouble.org site, and working with Marian to implement his visualization ideas on the site. The perfect holiday gift My favourite personal anecdote about Beautiful Trouble is that everyone who stopped by my Toronto studio to pick up a copy this summer contacted me the following day to ask for another copy or two; A testament to the fact that the excellent content in the book is only outdone by the beautiful design of the book itself. At more than 450 pages, it’s a whopper of a book, and at only $25 it’s a steal. So we’re working with our favourite publisher, OR Books, to figure out some kind of a holiday promotion. This is a seriously great stocking stuffer for the activist in your life. Other than that, we’ve all been trying to recover from the hectic summer book tours in Canada and Europe, and trying to re-focus on where to take Beautiful Trouble next. If you have idea, or would like to get involved, drop us a line.